Monday - Rest day. Feeling the fatigue in my legs a bit today after WTC 50k and a hilly 10M run on Saturday/Sunday. 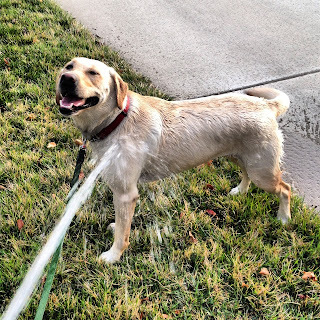 Tuesday - Lucy's happy about the time change... more time for off leash running after work! Temps are in the 70's, feels like spring. Ran 4.5 miles on my local trails. My legs were asking me if I'm really planning on running a marathon in 5 days. Wednesday - I woke up this morning wanting to cut my run short from 8 miles to 4-5. I had plenty of excuses... "ran a 50k four days ago", "going to run a marathon in 4 days", "my legs are tired". Once I started running, my legs felt pretty good and I reminded myself that you don't get in 100k race shape by taking the easy route. My legs are feeling better than yesterday, I'm getting excited for the LA Marathon! Ran 8.03 miles before work. Thursday - 4 mile morning run with Lucy. Time to start tapering for LA! Friday - Driving to Santa Monica! Rest day. Saturday - Arrived at the hotel in Santa Monica a little after midnight. Went for an easy ~2.5 mile run along the beach with Candace. We really enjoyed the day, after the quick run, we met up with our cousins Michael and Vanessa for lunch at Native Foods, in Santa Monica. Lunch was fantastic, I stuffed myself. My friend Billy was nice enough to shoot us an invite for dinner. We picked up another cousin of ours and headed over to Pitfire Pizza in Manhattan Beach. Chowed down some more carbs, enjoyed the company and meeting some great people and then headed back to the hotel to get ~6 hours of sleep. Sunday - LA Marathon Day. I woke up at 4am, ate a large bowl of oatmeal and two bananas. I put on my shirt and tie and headed down to the marathon shuttles, which were conveniently located across the street from our Hotel. I was on a bus a bit after 4:30am and arrived at Dodger Stadium around 5:00am. The race was scheduled to start at 7:28 am, so I had some time to kill. I wandered past the big stage that had a DJ pumping beats and go-go dancers waving light bars around (an interesting sight at 5am) and into the stadium. I poked around a little, looking for familiar faces and then decided to sit down in the right-field seats. After ~15 mins, I got up to check out the bathrooms and noticed a ~100yd long line. I noticed that there was hardly anyone in the left field area, so I headed over there and found that only about 5 people were in line. Next I sat down in the concourse, talked running with a few guys, and decided to walk around again. I was lucky enough to bump into Billy, Dave (my pre-race dinner pals from last night), and Guillaume, who I had not met before. I walked up on a pretty funny situation, as a couple of friends of Billy's had just walked up while Dave was in the middle of performing "the Gatorade bottle trick", leaving Billy to decide whether the polite introduction of his friends to Dave was really appropriate at the time. Oh, "the Gatorade bottle trick" involves wearing a hefty trash bag (common among chilly marathoners waiting for a race to start) and using a Gatorade bottle as a make-shift port-o-potty. ;) Anyway, the friends walked off, Dave was not introduced and the four of us proceeded to talk race strategy and joke around.. Billy and Dave were targeting ~3:20-3:30 finish times while Gui and I were looking more at the 4:00 range so we decided to stick together once the starting gun fired off. Around 7am, the four of us meandered over to the open (un-seeded) starting corral. It was a major cow herd at the starting corrals and was hard to tell which way the start line was. The PA loudspeakers boomed to life, welcoming us all, announcing the women's elite start, and ~18 minutes later, the men's start. Roughly 3 minutes after the elite men's start, it was time for us to go. Randy Newman's "I Love LA" started jamming out of the speakers and the massive, slightly bewildered crowd of ~25,000 runners started to flow towards the start line. We all shared some high-fives, shouted some encouragement, wished each other luck and as we crossed the starting mats, we began our race. 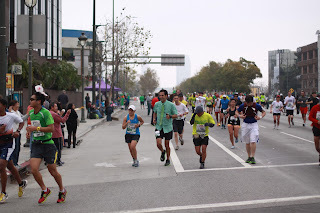 My first LA Marathon. Billy and Dave quickly disappeared. Gui and I stuck together. I had been sharing my race strategy with Gui and he was on board with it. I was not going to push the pace at all in the first half and wasn't going to pay attention to pace groups. Just run comfortably in the first half and if our legs were still with us, we'd pick it up in the second half and push for a sub 4 hour finish. The first mile was painfully slow and at times I wondered if we were so far back in the crowd that it would impact our chances of finishing under 4 hours. After 1/2 mile, we were averaging a 12 min/mile pace due to the heavy congestion. Regardless, I didn't waste any energy trying to weave around people and we soon hit a nice downhill stretch, which really got the crowd moving. Traffic was not an issue from here on. We left Dodger Stadium and headed Downtown. In the first few miles I was trying not to let the adrenaline get to me and focused on keeping my pace over a 9:00 min/mile. As we left the high rise buildings of Downtown LA, during the 4th-5th miles, the course gained roughly 200 ft. in ~1.5 miles. I actually felt my legs really deaden right around mile 5. It felt like a legitimate energy drain and I was worried that my effort at Way Too Cool 50k 8 days earlier might catch up to me and that I might be in for a long and uncomfortable day. 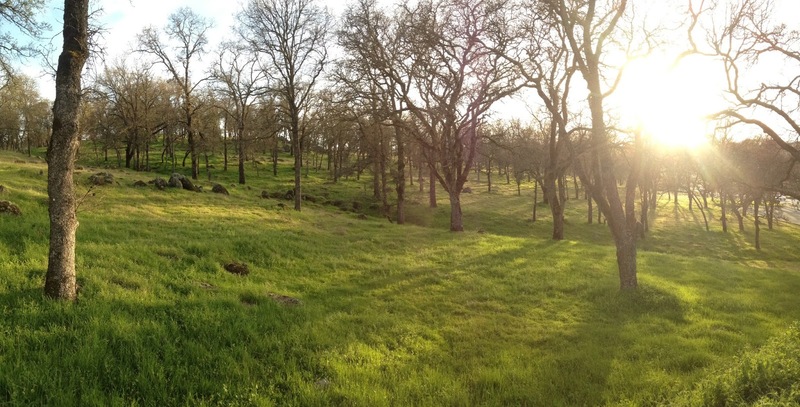 Thankfully, by mile 6, everything was feeling fine again and my worries subsided. We passed the 4:30 pace group a bit after mile 5. ASICS LA Marathon: Paul Grimes at the 10K Split in 57:56. The Asics LA Marathon App was posting splits to my facebook page and twitter every 10k. It was nice to look back at my splits after the race and to see the "likes" and encouragement I was getting. The next few miles, through Silver Lake and into Hollywood, had very mild inclines and declines and trended generally downhill. Gui and I were feeling great and were enjoying good conversation. Gui offered to take some pictures of me in the Hollywood area and snapped a great one while I was running backwards 20-30 feet ahead of him. The Chinese Theater, the Walk of Fame... Hollywood was cool and our race was going well. At around mile 12 there were a couple notable inclines and Gui mentioned that these were taking a toll on him. We backed off the pace and I hoped his feelings would be fleeting. We passed the 4:15 pace group in mile 12. ASICS LA Marathon: Paul Grimes at the 20K Split in 1:53:43. We hit the half-marathon mark, which was not recognized in any way on the course, in almost exactly 2 hours (2:00:14). I was feeling pretty good, but was only feeling about 65% confident of finishing under 4 hours. Gui's fatigue didn't seem to be going away, but his spirits were still good. Unfortunately around mile 15, Gui needed to fall off the pace. He told me to go on. We shook hands gave each other some encouragement and drifted apart. The course experienced a significant downhill stretch here and I let gravity do its job, letting myself run some mid to low 8 minute miles. From mile 15-16 on, I started passing A LOT of people. My pace was deliberately faster now. This was when my plan was to be executed. I was getting deep into the second half of the race and I was feeling good. The race felt different now, it was time to push and time to keep smiling. I ran through Beverly Hills. ASICS LA Marathon: Paul Grimes at the 30K Split in 2:49:11. I heard my name being called during an uphill portion of mile 20. I looked over and was elated to see Candace and Kristina jumping up and down and waving! I veered towards them, waved and said "Hi". 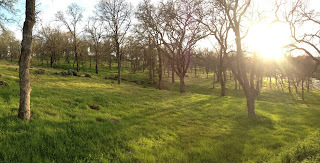 They cut a corner and caught up to me a few hundred feet later and then they were gone. Mile ~19.5 - mile 22 was home to the last mention-able uphill of the course and I pushed comfortably hard up it. My Garmin had been hitting mile splits a good 2-3 tenths of a mile before the course markers, so I knew that at Mile 20 on the course, I might have as much as 7 miles left, but with roughly 10k to go, I knew I was in prime shape for a sub 4 hour finish and was flirting with a PR. I was still feeling really good for being this late in a race. I was now prepared to lay it all out and endure some pretty serious discomfort in order to PR. I continued to pick up the pace and I continued to smile. Oh, by the way, the green dress shirt and green tie were a hit! I was getting lots of cheers, laughs, and encouragement from the deep field of spectators. 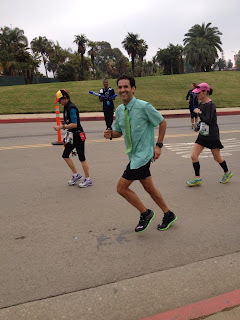 Around mile 22, someone shouted "Hey, you're tie's crooked!". I laughed, made eye contact with the guy and adjusted my tie. From this point on, I was almost constantly looking at the spectators as I passed them by. When it hurt, or if I wanted to slow down, I would make eye contact with someone and smile and they would laugh and say "Nice tie!" or "Great outfit! ", everyone seemed happy and so was I. The state of California, in the area of Santa Monica, was blessed with a fantastic section of downhill en route to the Pacific Ocean! I had a little over a 5k left to run and nothing was going to stop me. I displaced discomfort with determination and happiness. I passed the 4:00 pace group in mile 23-24. As I approached the group, I shouted out something like "Looking GOOD 4 hour group! Time to make it hurt, this is what we're here for! Let's Go Get It!". The 4 hour pace leader joined in with a "We're almost there! No walking! Let's go to the beach!" I charged passed them, pushing low 8:00 and high 7:00 minute miles on tired legs. The more it hurt, the bigger I smiled (thanks for that JDF). The last few miles of marathons and ultras are always quite surreal to me. It becomes obvious that this effort, this endurance event you've been a part of is actually coming to an end, but at the same time, the remaining distance can seem so long. I turned off of Santa Monica Blvd. and onto Ocean Avenue. I had about a mile to go and I ran hard. I was getting my third consecutive sub 4 hour finish, this time a week after running a 50k race that had ~5k feet of elevation gain. As I crossed the finish line, I knew that I beat my marathon PR by about a minute (turned out to be ~2 minutes faster). Shortly thereafter, after eating a banana and some Powerade, I realized that I just had my best marathon experience ever. I was proud of how hard I pushed. I thoroughly enjoyed the course, the people, and city. I ran a smart race and at the same time, I gave it all of my effort. This was the first time I had ever run EVERY step of a marathon (I almost did last time, but I had to take a bathroom break). In the first half I was not stupid and in the second half I was not a wimp. I had such a great time. A+ to the LA Marathon, I'll have to do that again sometime. Paul Grimes at the Finish in 3:54:31. Lucy, enjoying a post-run shower. Nice run along the Santa Monica Beach bike path. Caught a 4:30 am shuttle to the start. Staying warm and passing time in the stadium seats. Hanging with Gui, Billy, and Dave, pre-race. The starting corrals were a madhouse, but when it was time to go, everything just worked. I didn't even know which way we were supposed to run for a while! Moseying out of the staging area. Running backwards through Hollywood, mile ~10. The Chinese Theater in Hollywood. Mile 18. Last time the camera came out during the race. Time for things to get real, time to make it hurt, ~8.5 miles to go. Am I the only one having fun in mile 19? Keeping my shirt and tie right, uphill at mile 20. Really nice finisher's medals. Incredible day! Awesome report man (other than the wonky dates)...great hanging with you this past marathon weekend!